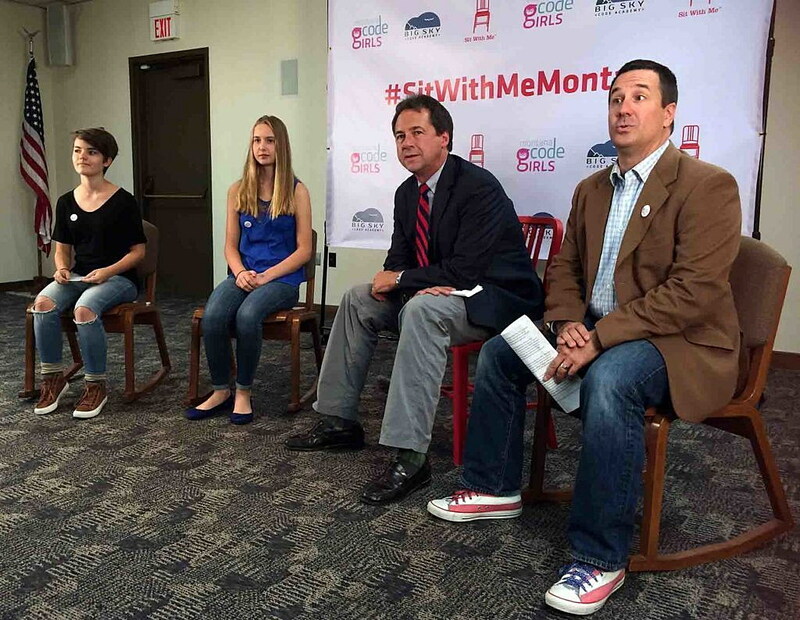 Devin Holmes, founder of the Big Sky Code Academy and Montana Code Girls, joined Montana Gov. Steve Bullock in Missoula on Thursday – along with several graduates of last year’s pilot course – to say the program is looking to enroll 150 new students across the state this year. Montana Code Girls began last year as a pilot program with four students through the Technovation Challenge organized by AmeriCorps. The program challenged girls to build a mobile app that solved a social challenge in their community. Ailey Robinson and Sophia Richter, both students at Hellgate High School, entered the challenge under the sponsorship of Montana Code Girls to create an app that addressed depression. The resulting product contained a self-evaluation test built on the PHQ-9 depression test questionnaire used by psychologists. The app also contained a history function, where users can see the results of past tests. It also offered helpful resources vetted by their school psychologist. Students enrolled in Montana Code Girls learn more than coding. Students learn the entrepreneurial skills of writing a business plan, doing a pitch video and completing a market analysis. Richter said the program inspired her to reach out to other young women and tell them it’s okay to code. She described it as an important part of the technology future, one she encourages other girls to explore. It’s a point on which Bullock agreed, especially as his administration continues to tackle the disparity in pay between men and women in Montana. Having a more diversified workforce will help businesses succeed while breaking down gender barriers, he said. According to Holmes, a recent study found that girls who take Advanced Placement computer science classes are 10 times more likely to study computer science in college. Encouraging girls to embrace technology at a younger age could go far in shaping the state’s future workforce, and change stubborn social challenges. Missoula County Public Schools, the Missoula Public Library and the state’s colleges and universities are working to achieve similar goals, Homes said.